To secure the booking a £50 non refundable deposit is required and the balance is due 4 weeks before plus a £70 refundable damage deposit. This payment is non-refundable if cancelled after balance has been paid. My caravan is located on Presthaven Beach Resort about a 10 minute walk to all the amenities etc, a nice quiet area. 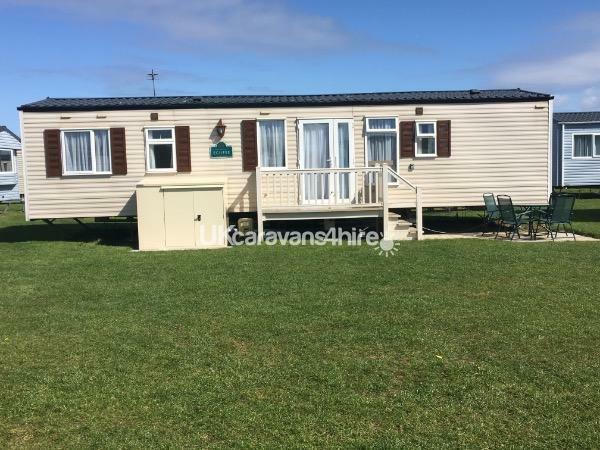 My caravan is situated on a lovely large outside grassed area safe for the little ones to play there, you will see the reason why I have picked this lovely area, It really is a home from home caravan, this also is my holiday home to. The caravan has 3 bedrooms one which has its own en suite bathroom and a further bathroom by the other two bedrooms. It has central heating and double glazing to all rooms, iron and ironing board available for you to use. The living room as a TV, freeview,DVD player,the kitchen has a integrated fridge/freezer,toaster,kettle,microwave. 7nights Pass Per Adult is £45.50 Adults £23.90 Per Child. We do not allow smoking the use of vapours or large groups of males/females as per Presthaven Beach Resort park rules. New for 2018 a outdoor pool. The indoor heated pool has a slide and water activities from aqua gliders to water walkers along with a sauna. The outdoor lazy river is a great addition. New for 2017 are brand new spacious swimming pool changing areas. At Presthaven Beach Resort there are 2 indoor pools, one with a water slide and an out door pool and a lazy river, there are 2 show bars and also a pub/restaurant, there is crazy golf, go carting, a high wire obstacle course, amusement arcades, football pitch. They also have a day and night time entertainment programme as long as you have bought the passes then you can join in all the activities. You will never be bored here and will find something to do for all the family, even beyond Presthaven there are lovely parts of North Wales to explore. The park also has a well stocked grocery shop, launderette, fish and chips shop, a pub/restaurant, Papa John pizza (with delivery service to caravan), Burger King and a gift shop. Wi-Fi access in all public communal areas. The caravan must be left in a clean and tidy condition with bins emptied please.